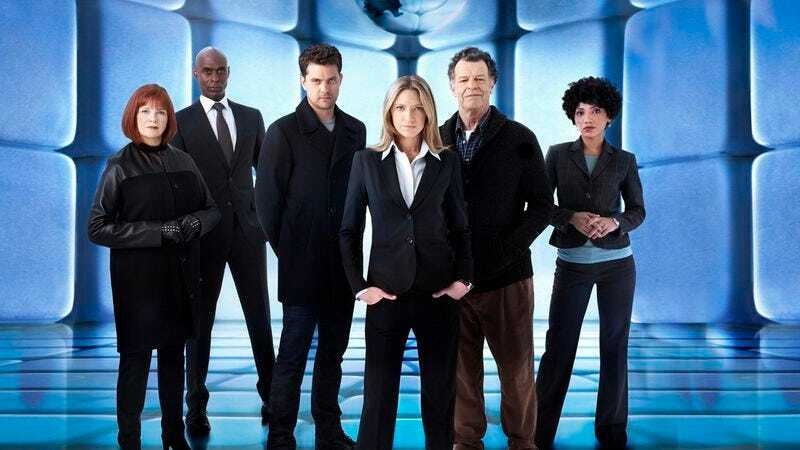 When Fringe debuted in 2008, creators J.J. Abrams, Alex Kurtzman, and Roberto Orci talked a lot about how the show would be simple, episodic, and drop-in-friendly—a sci-fi/horror/procedural mash-up that would have a mythology, but would mostly follow a case-of-the-week format. But while Fringe did fairly well in the ratings in its first season—and was a solidly entertaining show—it turned a corner creatively in season two, when showrunners J.H. Wyman and Jeff Pinkner began answering some of the questions the first season raised, and setting up a more complicated, multi-generational, multi-dimensional, fate-of-the-world-in-the-balance epic. Fringe shed viewers along the way, but Fox stuck with the show, and is allowing Wyman (minus Pinkner, who left after season four) to complete the story with a 13-episode fifth season, beginning September 28, at 9 p.m. Eastern. Any show with an overarching story as involved as Fringe’s is going to be tough to jump in on—but not impossible. Here’s the basic premise: Anna Torv plays Olivia Dunham, an FBI agent who works under Philip Broyles (Lance Reddick) in “Fringe Division,” a special force tasked to investigate a pattern of supernatural events. Aiding Dunham and Broyles is Dr. Walter Bishop (John Noble), a brilliant scientist who used to work alongside the mysterious Dr. William Bell (Leonard Nimoy), and who, with Bell, experimented on Olivia when she was a girl, activating her latent psychic/telekinetic abilities. Bishop and Bell also discovered another, near-identical Earth in an alternate dimension, and when Bishop’s son Peter died as a boy, the scientist breached the barrier between worlds and kidnapped the Peter of “Earth-2.” That incident led to an increase in destructive supernatural activity in the other world, which prompted the other Walter Bishop—nicknamed “Walternate” by the Earth-1 Bishop—to launch a series of inter-dimensional attacks, while also prompting a guilt-ridden Walter to start losing his mind. All of these skirmishes have been watched impassively for decades by a group of odd, bald, business-suited men known as “The Observers,” who are especially concerned with the fate of the adult Peter Bishop (Joshua Jackson), whom they see as the key to their own future. Toward the end of season four, Fringe viewers got a glimpse of that future: a dystopian world, ruled by The Observers. The episodes below all rely to varying degrees on the Fringe mythology, and a few of them are essential to advancing the five-season-long master-plot. But they each also contain the essence of what’s special about Fringe, and help explain why its fans are so devout. “White Tulip” (season two, episode 18): If a Fringe newcomer wanted to watch a single, superior episode that doesn’t require elaborate explanations, “White Tulip” would be the one. Peter Weller guest stars as a grieving astrophysicist who’s been making small jumps back in time while tinkering with the mechanics and calculations required to make a jump back to the moment when his fiancée died in a car accident. Fringe Division struggles to piece together the facts of the case, since their suspect keeps vanishing into the recent past and making subtle changes, but finally Walter is able to corner the man for a mad-scientist-to-mad-scientist conversation about the dangers of tinkering in God’s domain. “White Tulip” ends powerfully and poetically, with a moment that crystallizes the series’ inquiries into the boundaries between the scientific and the supernatural. “Over There” (season two, episode 22): Fringe’s two-part season-two finale is practically a victory lap after a run of episodes that elevated the series from “likable time-killer” to “top-flight sci-fi TV.” These two hours put nearly everything into play that the Fringe writers had introduced over the previous two years, as Olivia Dunham leads a team of super-powered humans who had been villains-of-the-week in earlier episodes, and crosses over to Earth-2 to warn Peter Bishop that his real father plans to bring about the destruction of Earth-1. It’s poor, displaced Peter’s return to his “home” that anchors “Over There,” as he adjusts to a world and a family that’s not at all what he expected. Yet unlike the at-times-gloomy world of Earth-1, Earth-2 on Fringe tends to be a kick for the show’s viewers to visit, with its blend of advanced technologies and archaic quirks. (They travel by dirigible over there, for example.) The Fringe Division of Earth-2 is more fun, too, with a swagger and a power that the Earth-1 team lacks. “Over There” is action-packed, funny, strange, sweet, star-studded—especially given that some of the main cast-members play dual roles throughout—and has one heck of a twist ending, setting up the season that most Fringe fans consider to be the show’s best. “The Plateau” (season three, episode three): In its third season, Fringe split time between Earth-1 and Earth-2, returning to a “case-of-the-week” structure while revealing a little more about how the fate of the two worlds are connected. “The Plateau” involves an Earth-2 Fringe Division case, featuring Michael Eklund as a man who has artificially boosted his intelligence to such a degree that he can predict the immediate future, and can use small distractions to create circumstances where chaos will ensue, to his benefit. Director Brad Anderson (who has helmed some of the snappiest Fringe episodes over the years) brings energy and style to “Plateau,” as the audience sees the villain contemplate every possible scenario in any given situation via constantly shifting split-screens. And while “Plateau” is nifty just as a cat-and-mouse thriller with a sci-fi twist, it’s also true to one of the major themes of season three, as the bad guy causes problems by inciting other people to do what comes naturally. This will be turn out to be the nature of the conflict between Earth-2 and Earth-1, which is mostly a calculated Cold War, based on baiting and supposition. “Marionette” (season three, episode nine): Fringe was as much horror as science fiction when it began, and the series has never completely abandoned its fascination with monsters and serial killers. “Marionette” may be the show’s finest hour of horror, telling the disturbing tale of a doctor who takes back the organs that the woman he loved donated when she killed herself, and tries to use them reconstruct and reanimate her. The image of the woman’s stitched-together corpse, propped up with string, is easily the most unsettling in Fringe’s entire run, but what makes the episode work is that as with all the best Fringe villains, this one is somewhat sympathetic, only inconveniencing other people to get back what he feels he deserves. It’s a situation that recurs on Fringe, running parallel to Walter Bishop’s original sin of kidnapping Peter-2. And in this episode it also parallels the troubled relationship between Peter and Olivia, who’ve been changed—perhaps permanently—by their respective times on the other Earth. “Lysergic Acid Diethylamide” (season three, episode 19): One sign that Fringe had come into its own in its second season was that the producers felt confident enough in what they’d created to go way off-model with the musical episode “Brown Betty,” a noir-influenced bedtime story that reflected the themes of the show but didn’t really advance the plot. That was the 19th episode produced for the second season (though the 20th aired, because of a season-one holdover), and Fringe has continued to treat the 19th episodes of each season as an opportunity to play. For example, in season three’s 19th, “Lysergic Acid Diethylamide,” Peter and Walter enter the mind of Olivia Dunham, which has been possessed by their old friend/nemesis William Bell, and work their way through her psychic defenses to rescue her ego. The stylistic twist? Olivia’s mindscape is depicted as a trippy animated cartoon, where anything is possible—and probable, really. Some Fringe fans dislike the episode-19 gambit, because these episodes tend to be bizarre, and often tangential to the main plot. But they’re also memorable, and a prime example of how Fringe stopped being ordinary and started becoming ambitious—and even inspired. “One Night In October” (season four, episode two): Just as Fringe’s second season ended with a plot twist that set up a thrilling season three, so the third season ended with a twist that set up season four. The difference is that many Fringe fans disliked what happened at the end of the third season: a timeline-changing event that seemed to remake the characters and their world into something fundamentally different than what the audience had been watching for three years. The debate about whether the producers wrecked their own overarching story still rages—and will continue on until the series finale, undoubtedly—but speaking strictly in terms of generating well-written, well-directed, beautifully acted episodes of television, Fringe’s fourth season didn’t miss a beat, and in fact delivered as many series highs as season three. Case in point: “One Night In October,” another strong Brad Anderson-directed episode, starring John Pyper-Ferguson as an Earth-1 clinical psychologist, recruited to help track down a serial killer on Earth-2 that turns out to be his other-dimensional counterpart. Both versions of this man suffered the same traumatic childhood and have the same psychopathic tendencies, but one caught a break along the way and one didn’t, and as “One Night In October” races to its exciting and heartbreaking conclusion, Fringe once again contemplates the small events and elements that define who a person is. “And Those We’ve Left Behind” (season four, episode six): Another Brad Anderson-directed gem, “And Those We’ve Left Behind” stars Stephen Root as an engineer suffering his wife’s Alzheimer’s-induced deterioration. When he attempts to use her theoretical research to turn their home into a time-bubble—permanently located in the time before she slipped away from him—the effects ripple out through the northeast, causing other people and places to slip backwards unexpectedly. It’s a familiar Fringe theme—the driven man of science wreaking havoc on other people’s lives—given added poignancy by the performance of Root as a man who refuses to let go of this woman who looks so much like the person he loves, but no longer behaves the same. That the woman is played by Romy Rosemont, Root’s real-life wife, only makes the episode more potent—not to mention the fact that Root’s dilemma reflects the feelings that so many disillusioned Fringe fans were having at the time. “Letters Of Transit” (season four, episode 19): Season four’s 19th episode differs from “Brown Betty” and “Lysergic Acid Diethylamide” in that it’s not so much a detour as a signpost, pointing the way to where the rest of the series is headed. Set in the near future, after Earth as been taken over by The Observers, “Letters Of Transit” follows a couple of rebellious agents in the now-authoritarian Fringe Division as they seek to locate and free the show’s heroes, who’ve been frozen in amber for 20 years. At this point in the fourth season, the events of “Letters Of Transit” had little to do with the main storyline, and had Fringe been canceled at the end of season four, this episode would’ve stood as a tantalizing glimpse at a road not taken. Instead, reports are that season five will be all about this future, tying up Fringe’s loose ends along the way. Regardless, “Letters Of Transit” would be worth watching even if it were a one-off, because it’s a touching reflection on the character of Walter Bishop, who appears here both as a babbling but lovable buffoon and a hard-nosed man of action. Fringe has always been about what defines a person, and it’s never as on-point as when it’s looking at what makes Walter Walter. “Worlds Apart” (season four, episode 20): For the better part of four seasons, Fringe followed the ramifications of a covert conflict between two versions of the planet Earth. With “Worlds Apart,” the show largely resolved that conflict, which had been winding down since the season-three finale rendered it mostly moot. Rather than focusing on action-packed standoffs between heroes and villains, “Worlds Apart” serves as a muted, mournful goodbye to Earth-2, and to the alternate versions of the Earth-1 Fringe team. Each agent gets to spend some time with his or her counterpart, and consider who they might’ve become had their lives been altered even a little. This is a particularly good episode for two of Fringe’s most valuable players: Jasika Nicole, who plays the efficient Agent Astrid Farnsworth and her autistic Earth-2 counterpart; and Seth Gabel, who played the dashing Earth-2 Agent Lincoln Lee and his more bumbling Earth-1 self. The lingering animosity between the worlds fades as the time comes for them to separate, replaced by a deeper understanding of the choices each has made, for better or worse. Availability: All four Fringe seasons are available on DVD and Blu-ray. They are also available for digital purchase.